I grew up in the San Francisco Bay Area, so one of my comfort foods in life is chewy sourdough bread, preferably still slightly warm from the morning oven. 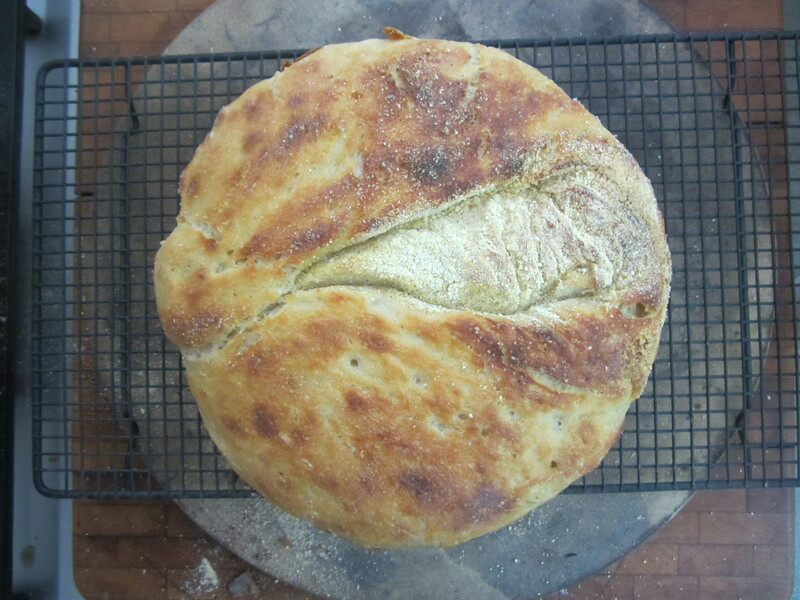 While there is decent, although not perfect, commercial sourdough bread available in Upstate New York now, when I first moved here in the late-80’s there was nothing. I experimented with homemade sourdough bread but it never quite worked out. 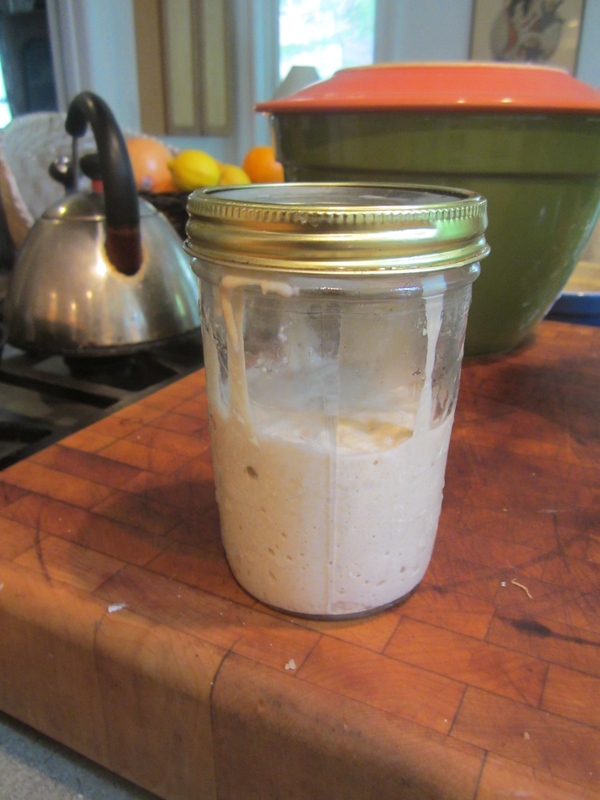 I haven’t tried it in the last twenty-five years, so I was thrilled to obtain some sourdough starter from the Saratoga Food Swap at Healthy Living Market. I have kept the starter going for a month now and baked bread four times. I have still not arrived at the bread of my childhood, but am getting closer. My biggest problem with bread has always been kneading so I like no-knead recipes and I love my all-powerful Kitchen Aid stand mixer that lets me knead by proxy instead of with my hands. But sourdough bread is even better for lazy kneaders like me, the starter bubbles and wells so kneading is unnecessary. Like all no-knead recipes, it takes some time, but that is a small price for comfort food. 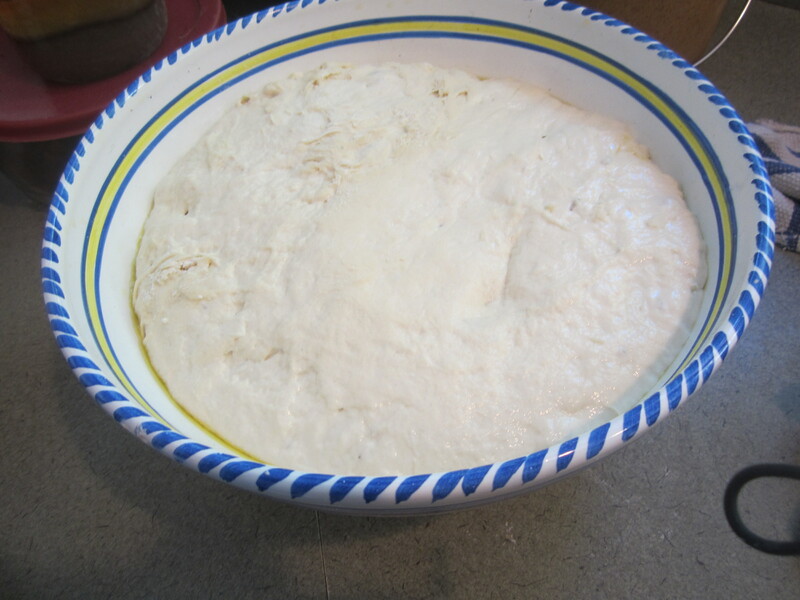 You can buy sourdough starter commercially or get it from a friend who maintains a starter. If you live near Saratoga Springs, NY and would like some, leave me a message and we’ll figure it out. To make one loaf of bread at a time, place 1 cup of your starter in a glass bowl then mix in 1/2 cup of room temperature water. 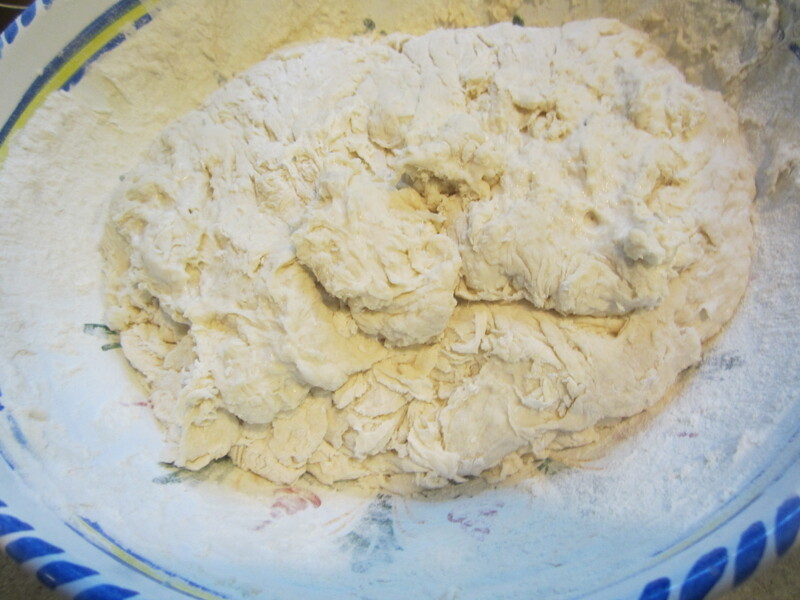 Add 1 cup of bread flour or King Arthur unbleached flour. Mix vigorously, using a wire whisk, then cover the bowl with a plate or plastic wrap and let it sit out on the counter for 3 to 4 hours. Place about one cup of it in a glass canning jar and stick it in the refrigerator for next time. Don’t screw the lid down tightly, since the starter may release some CO2. Use the second cup of starter left in the bowl to make bread. If you want to make two loaves of bread at a time or want to increase your starter to give to another person, double the flour and water you add to your starter. I refresh my starter once a week, even if I am not going to bake. It is like watering your house plants – small domestic pet care. If you have starter left over, throw it out in your compost pile. Don’t add it back to the jar, it will multiply and take over the universe or poison itself with waste by-products. Place three cups of room temperature water in a large bowl. Add one cup of starter and whisk thoroughly. Add three cups of bread flour and whisk, or stir with a spoon if it seems too thick for a whisk. Add the other three cups of the flour and 1 to 2 teaspoons of salt. The salt is necessary to temper the rising, otherwise the bread will rise quickly and then collapse. Mix thoroughly, you will probably need your hands for this stage. Cover the dough with a plate or plastic wrap and place the bowl in a warm spot in your kitchen to rise for 12 to 15 hours. Less time and the dough will not be sour and filled with air pockets, more time and it will collapse. On a hot summer day the rising time may be cut back to 8 or 9 hours if your house is not air-conditioned. If you need to stop at this point, put it in the refrigerator and take it out to continue when you are ready. Flour your hands and sprinkle some flour across the top of the dough. Scoop and sweep your hands under the dough to remove it from the bowl. Turn it out onto a floured work surface, then wash out the bowl (not easy, this dough is sticky), dry it and coat it with olive oil. Put the dough back into the bowl and let it rise for 2 to 4 more hours depending on the temperature of your kitchen. Peek at it now and then because if it starts to collapse, it has gone too far. When you are ready to bake, preheat your oven to 450 degrees. Place a covered cast iron pot or a baking stone in your oven to preheat with the oven. If you use a pot, your loaf will be round, like the loaf in the photo above. If you use a baking stone, it will splay and be thinner. If you are using a cast iron pot, when the oven is ready quickly remove the pot, add some corn meal to the bottom and plop the dough into it. Make a slash mark or two or four across the top of the dough. Cover the pot and bake for 30 minutes. Remove the lid and bake 15 more minutes. Turn the bread out of the pot. If you are using a baking stone, place a shallow roasting pan on an oven rack under the rack where you have placed the baking stone. Move your dough from the bowl onto a pizza peel covered with corn meal to keep the dough from sticking and make slash marks across the top. When the oven is ready, slide the dough onto the baking stone, pour 1 cup of water into the roasting pan and shut the door. Bake for 45 minutes and remove the hot bread from the baking stone with the pizza peel. Let the bread cool completely on a wire rack before slicing. It is tempting to cut into it while warm but bread does much better if you let it cool before slicing it – it finishes its internal baking with the crust intact and maintains its beautiful interior structure. Or make two loaves and eat one warm because you can’t stand waiting and let the other one cool completely. I have tried this method before-my bread ended up very hard and too crunchy. Any ideas what went wrong? Lovely blog by the way! The bread I bake on a baking stone instead of in a covered pot comes out crunchy-ish and thin. But not very hard. if you didn’t add the glass of water in the pan in the bottom rack, it would probably come out rock hard. Steam helps. Ah!! I did add water but not much so that’s probably it! Thank u!! great, hope it works. 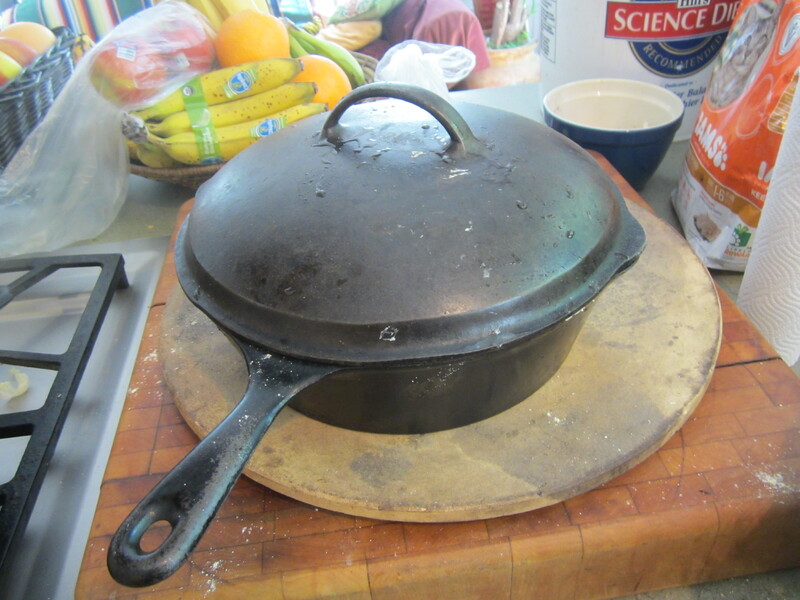 Covered cast iron pots accomplish the same thing, steaming the bread slightly. Other than the million steps, is it generally an easy recipe? I love sourdough but baking bread, other than a loaf of banana bread really scares me. I’ve failed so many times but would love to learn. Oh, I make these sometimes too. Yum! Brot mit Sauerteig- Ich knete gar nicht , der Teig ist so dunn das man ihn nicht kneten kann. Hier ist es ein Roggenbrot. es geht aber auch mit Weizenmehl. 200gr Roggenmehl und 200ml lauwarmes Wasser zugeben, verrühren und 12 Stunden stehen lassen wie gehabt. Danke schön, ich probiere das! thanks. We have been defunct for a while but are about to start up again. I will definitely check out your blog. Always love making fresh sour dough bread. It’s time for me to make a new starter…..
thanks, I will check out your blog. Good luck with the bread.